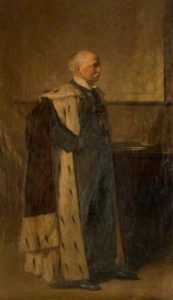 Reid, George; Sir William Bilsland (b.1847), Lord Provost of Glasgow (1905-1908); Glasgow Museums. Sir William Bilsland was born on St. Patrick’s Day, 1847, at Ballat, near Balfron, of forebears who had been for several centuries farmers in the neighbouring parish of Kilmaronock. His brother, James ran a small family bakery in Anderston Glasgow where he was later joined by his brothers, William, Alexander and John. William’s main concern was the distribution of the family bread. He acquired 12 vans, as well as horse and carts. Bilslands bread was distributed all over Scotland. He later acquired other firms including Gray and Dunn biscuit manufacturers in 1912. William later became Lord Provost of Glasgow and was created a baronet in 1907.